The term "carrousel" meaning "little war" comes from the custom of staging military shows or exercises mainly for the delight of the royals. One very famous carrousel was held in June 1662, at the command of Louis the XIV, whose reign was known for the splendor of extravaganzas such as this. On the field between the Louvre Palace and the Tuileries Garden, knights costumed in full regalia performed feats of horsemanship, accompanied by music and song. To this day, the place is known as The Carrousel. 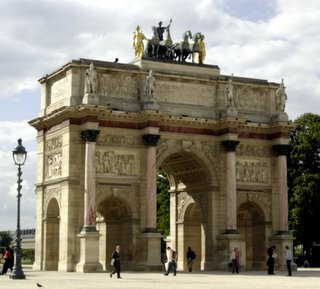 It was here that Napoleon I commissioned one of his two great arches, the Arc de Triomphe du Carrousel. This Arc was modeled after the Arch of Septimus Severus in Rome. It was designed and built by architects Charles Percier and Francois Fontaine between 1806-1808. It is composed of three arches. The arch is 63 feet high, 73 feet wide and 24 feet deep. The columns and front paneling are made of a beautiful rose marble which adds dramatic touches of color at different times of the day or when it becomes wet from rain. Looking West through the Arc you are treated to a wonderful view of the Obelisk of Ramses in the Place de la Concorde, up the wide expanse of the Avenue des Champs-Elysées to Napoleon's larger arch, the Arc de Triomphe. If the weather is clear, you will see, even further in the distance, the Grande Arche de la Défense. This is simply one of the great views of Paris. The top of the Arc has a chariot with a team of horses. Originally, the horses were from the Cathedral of St. Mark's in Venice, a small token picked up by Napoleon. They were graciously returned in 1815. The sculptures of the horses, chariot and figure now atop the Arc de Triomphe du Carrousel were built by Baron François Joseph Bosio in 1828. One can easily take some time here wandering through the arch and the nearby hedge-mazes, not to miss, of course, the grand view of architect I.M. Pei's pyramid in the courtyard of the Louvre.